Here’s what’s up in the world of TV for Thursday, June 30. All times are Eastern. The Teen Titans Go! And Powerpuff Girls Completely Organic Crossover Special (Cartoon Network, 6 p.m.): You’ve got to give Cartoon Network credit for telling it like it is with the title of this crossover special. Depending on which superhero team you ask, the Teen Titans and the Powerpuff Girls either join forces or face off when Mojo resurfaces in Jump City. Personally, we can’t wait for Raven and Buttercup to realize they should definitely be best friends. Regular Show (Cartoon Network, 7:30 p.m.): It’s Rigby’s graduation day! The twentysomething raccoon finally finishes high school and is chosen to deliver the speech at his graduation ceremony. 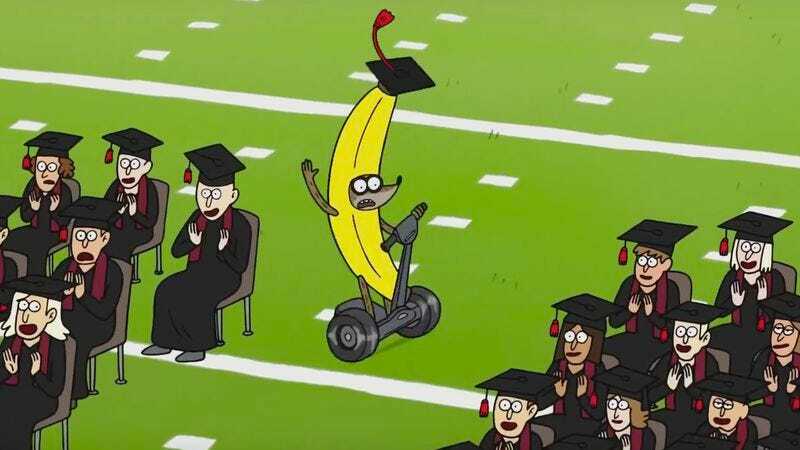 The double-sized seventh season finale promises some classic Rigby anxiety and the sight of Rigby riding a Segway in a banana costume. U.S. Olympic Trials: Swimming (NBC, 8 p.m.): Let’s go ahead and assume all the potential Olympians competing in tonight’s swimming finals are using thoughts of Shark Week to really motivate their butterfly strokes. Greatest Hits: 1980-1985 (ABC, 9 p.m.): ABC kicks off a six-part series celebrating the biggest songs of the ’80s, ’90s, and 2000s. Hosted by Arsenio Hall and country singer Kelsea Ballerini, the series features musicians like Ray Parker Jr., Kenny Loggins, and Rick Springfield performing their classic hits. Plus contemporary artists like Jason Derulo sing tributes to ’80s stars like Michael Jackson, which will certainly be fun and not at all disappointing. My Crazy Ex (Lifetime, 9 p.m.): Check out the third season premiere of a show that doesn’t have Crazy Ex-Girlfriend’s satirical excuse for its questionable title. Shark After Dark (Discovery Channel, 11 p.m.): Eli Roth wraps up his Shark Week after-show, which means he’s only four more after shows away from becoming Chris Hardwick. I Ship It, “Episode 1” (CW Seed): Promising up-and-coming director Yulin Kuang adapts her 2014 YouTube short film into a web series for The CW Seed. A fandom-themed musical rom com, I Ship It follows a young woman named Ella who enlists her best friend Tim to help her get revenge on her ex in a nerd-rock Battle Of The Bands. Harry Potter and Pokemon references ensue.